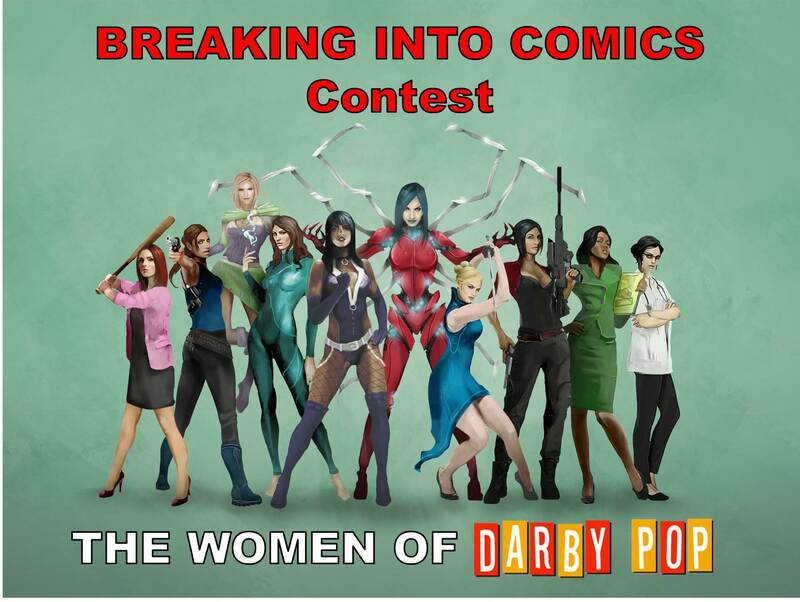 If you are an aspiring comic book writer or artist who has dreamed of working in the comic book industry, then Darby Pop Publishing has the opportunity for you with their second “Breaking Into Comics” contest. Now through May 13, Darby Pop is running a contest to find the best scripts and sample art for an anthology book, Women of Darby Pop, featuring (at least) one female character from Darby Pop’s Indestructible, City: The Mind in the Machine, The 7th Sword, Doberman, Dead Squad, Side-Kicked, Dead Man’s Party, and/or Fake Empire. With their second “Breaking Into Comics” contest, Darby Pop is giving both aspiring WRITERS and ARTISTS an opportunity to get a foot in the door of the comic book industry. Since Women of Darby Pop will be an anthology book featuring female characters from the books Darby Pop has published to-date, multiple writers and artists can/will get published. Scripts or sample art must feature (at least) one female character from Darby Pop’s lineup which includes: Stingray, Princess Power, and Gaia from Indestructible; Chloe from City: The Mind in the Machine; Superfecta 5 and Kathleen from The 7th Sword; Angela Garcia from Doberman; Vargas, Ayala Tal, and Dr. Nash from Dead Squad; Atalanta from Side-Kicked; Cynara Veil from Dead Man’s Party; and/or Charli, Lucy, and Jill from Fake Empire. Assignment: WRITERS will need to submit a 1 to 4-page complete comic book script (including dialogue and panel descriptions) and featuring at least one female character from Darby Pop’s lineup. ARTISTS will need to submit a sample pin-up or sequential page featuring at least one female character from Darby Pop’s lineup, plus 1 or 2 pages of sample sequential comic book art. Once Darby Pop has selected the winning Writers and Artists, they’re going to pair you up. Then, the winning Artists will bring the winning Writers’ scripts to life for the ultimate anthology. Prizing: If your script or artwork is chosen, it will be published by Darby Pop in their Women of Darby Pop anthology, a double-sized issue, which is scheduled to hit stores in September 2016. Winners will also receive copies of the finished book. Find out how to submit your script here. Deadline is Friday, May 13th. Check out the Women of Darby Pop Submission Form. Submissions not including signed release form will NOT be read or looked at.